The pie is mightier than the sword. That's an actual object lesson in The Help, a fictionalized melodrama about the peculiar intimacy of black domestic workers and their white employers in civil rights-era Jackson, Mississippi. It's a film that tries hard to be serious but can't help sticking out its tongue every now and then, as if desperate to break the monotony of all this grownup stuff. Viola Davis and Octavia Spencer star as two hardworking maids who reluctantly agree to let Emma Stone's plucky college graduate chronicle - anonymously - the juicy details and shocking revelations common to Jackson's black domestics, hoping it will draw greater attention to their plight. For a while, the film successfully toes the line between the joy of this unlikely sisterhood and the despair of three women who try to fit the roles defined for them with varying degrees of discomfort. Davis is the least feisty of the trio, but projects a convincing weariness when expounding on her lot in life. When she tells Stone in their initial interview that her mother was a maid and her grandmother was a house slave, it's clear that to her the terms are practically interchangeable. Ah, but then there's that pie. We have to go back a few steps to The Help's big bad, Bryce Dallas Howard, the queen bee of Jackson's insular group of bored, moneyed housewives. Her character oscillates between cloyingly inconsiderate and virulently racist as the plot dictates. Howard manages to pull this off without much affect (inescapable as Jim Crow was in the deep South, it might actually be accurate), but you have to feel for her and the other actors when the script takes them into movie-of-the-week territory, manipulating the audience with thuddingly obvious emotional cues. Sometimes this is done with a modicum of tact. But mostly it's along the lines of Spencer's relationship with a flighty bombshell (Jessica Chastain), full of wacky misadventures in housewifery one minute and sobbing admissions of miscarriages the next. The nadir is the ubiquity of the aforementioned pie, which satisfies the apparently generous number of people who were craving scatological humor in their civil rights dramas. At a robust two and a half hours, The Help is helplessly overstuffed. Stone receives a worthy foil of her own in her matrimony-obsessed mother (Allison Janney), but she also gets stuck in a subplot with a tepid love interest (Chris Lowell). The latter is the annoying kind of character that appears in movies solely to remove all doubts about the heroine's sexual orientation. Not that The Help needs to address any more burning issues. In fact, the film deserves credit for being far less sanctimonious than it could have been, and for attempting to frame the story as the maids' and Stone's shared triumph. You will notice, however, that Stone is the only one with a snowball's chance of getting out of Jackson. The rest are left to hope that someday equality will exist at home - a difficult prospect when the home where you spend most of your time is not your own. The Help gives us a pretty good idea of the frustrating realities for black women at the time; it's just ironic and a little dispiriting that the movie is padded with equally prominent instances of white girl problems. I had a much higher opinion of the film, which I think was due to the fact that I approached it as a book adaptation. Meaning that I look for it to cover the emotional high points of the novel but understand that it can't approach the depth or complexity due to time restraints. Looking at it from that point of view allows me to not be as disappointed with some of the film's shortcomings as you are. For example, the flighty housewife's issues are explored in more depth in the book, making her problems much more meaningful than they appeared in the movie. Also, Skeeter's relationship with her boyfriend is much more complex in the novel, and ties in a bit better to the overall theme. However, it was not what I considered to be an emotional high point and thus, I was fine with it getting minimal coverage in the film. But perhaps it could have been removed altogether. I disagree with you about the issue of the pie. I don't think it was included in the novel or the film to project wacky humor into the situation. Instead, I believe it shows the only type of way these maids could rebel against the treatment they receive. How can you make a statement without getting thrown in jail? Do something legal, but humiliating, to show the white woman how it feels to be humiliated as a black maid in the South. I think the inclusion of Skeeter's problems serves to make the novel and the film address a more complex issue than the treatment of black women at the time. 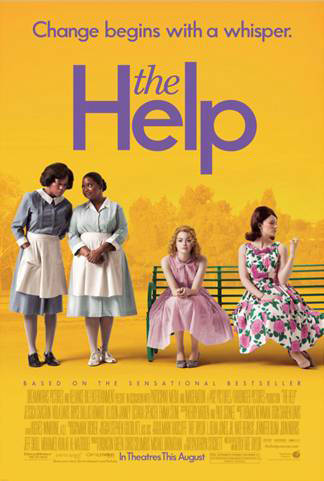 The Help is not just about the help, but is also about the white people who disagreed with the treatment of the help. Life was not perfect for anyone; each group has their own struggles. I'm not saying, and I think the book and film aren't' either, that the problems of Skeeter and the maids are equal. In fact, I think the fact that Skeeter is the only one who has an opportunity to overcome her problems addresses and reinforces the idea that although everyone has struggles, some are more complex or difficult than others. I'd be interested to hear your take on the novel, to see if the shortcomings you feel the film had are a result of the adaptation or are inherent in the story itself. Hey sis, I read what you wrote there and wanted to make sure I responded to your many good points. While it's true that you had a much higher opinion of the film, my focus on its shortcomings doesn't mean I thought it was terrible. On the contrary, there's a lot of good stuff in there. It's just that I think the problems I mentioned detract too much from its successes. I have not read the novel, but I could detect in the film a lot of issues I typically have with book-to-movie adaptations. I think you can be true to a story as it's written but adapt it with the specific knowledge that it's being translated into a visual medium - it should be more visceral. It reminded me a lot of "Never Let Me Go," a book I enjoyed with a movie that left me lukewarm. Too much was left for the audience to assume. "The Help" actually had the opposite problem, but the same basic solution: alter the story a bit to better fit the constraints of the medium (like a comparative lack of time with the characters). Oh, that pie. I don't think it was meant to be wacky, exactly, but it still strikes me as unnecessarily crude, especially in comparison to the film's overall tone. In a lot of ways, it's about how bad it feels to be denied your dignity by people you know very intimately. The pie, in my mind, doesn't make anyone more sympathetic. It's just ugly. And they couldn't stop mentioning it, like it was rakishly cute or something! I get it. She ____ her _____ in the _____. We'll have to agree to disagree. Further, I agree with you about why Skeeter's issues are important and how they enhance the overall story. Again, it's the execution that let me down. "The Help" wants us to feel like it's following Viola Davis' emotional journey - it's her narration that bookends the movie - but I felt like this was only true when it was convenient to the filmmakers. As soon as we are really delving into the world of the help, we are re-directed to Skeeter's world and how the help can serve the fulfillment of her goals. I'll admit that it's no "Remember the Titans" in this regard (with the young Hayden Panettiere teaching us all 'bout segregation), but balance was lacking in the emphasis of the characters' troubles. I suppose this is where I'd argue that a problem I had with the film was actually inherent in the story. I wanted "The Help" to be a little more daring, but it's difficult to do that when you're talking about the oppressed from the perspective of a sympathetic oppressor. I thought it was probably as good as you can get with that approach - decent, but not great.